Moon Mullins, a comic strip, created by Fred Willard and later by Ferd Johnson, ran in newspapers from 1923 to 1991. Moon, short for Moonshine, was a would-be prizefighter who was always short on cash but longed to live the high life. I envision Moon finally getting his wish, living the high life on the moon. He has found a lunar lander up there and turned it into a still. 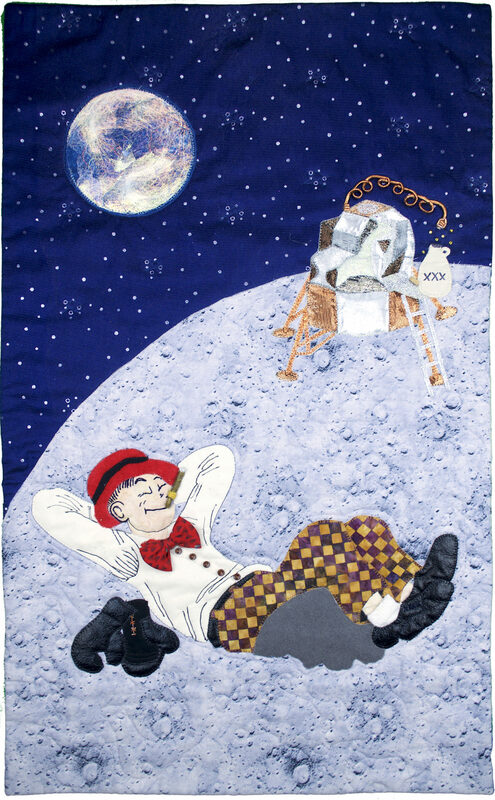 As he naps on the moon surface, he imagines the moonshine that he will soon be drinking, never realizing that it is all floating off into space. Moon Mullins is very dear to me, as my mother was a Mullins and her brother, Dr. Henry Clifford Mullins, has been called Moon all of his adult life. This quilt was made in his honor. Machine appliqued, machine quilted, machine embroidered, embellished. Commercial quilting cotton, men’s tie, sock, pleather, angelina fiber, felted wool, tulle, cording, beads.